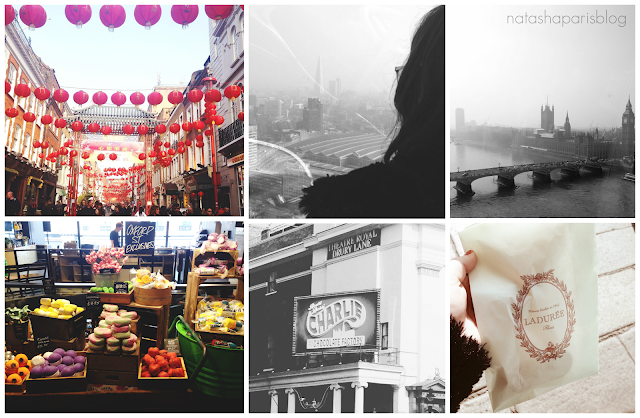 Last weekend I headed to London with my Mum for a girly weekend. We've done the same thing now for the past couple of years but this time was by far my favourite as we managed to fit so many lovely things into a short space of time. I thought I'd do a little post to tell you a little bit more about our weekend. We arrived in the city mid-afternoon on the Friday, and with the help of Google Maps we headed to explore China Town and Leicester Square. We then had a steady walk back to Trafalgar Square where we sat for a little while enjoying the afternoon sunshine. Whilst we were waiting for the coach to arrive to take us to our hotel, a number of police escorts rushed past us, closely followed by a number of cars with blacked out windows. Rumour has it that it may have been members of the Royal Family, however of course this isn't confirmed. Saturday was a jam packed day. We had already purchased tickets for the London Eye for the Saturday morning so that was our first stop of the day. Unfortunately the Weather was a little bit misty so the views weren't the best, however I did manage to get a couple of good pictures and it was nice to see some of the famous London landmarks in this way. After our ride on the eye we headed straight to catch the tube to Oxford Street. Whilst on Oxford Street of course I had to take a trip into LUSH. The flagship store wasn't open when I last visited the city so it was nice to finally get the chance to pop in and pick up some of the LUSH exclusive products (I'll put up a haul post soon). Whilst I was in LUSH I noticed that one of the Co-Founders was visiting the shop, which as a customer was amazing to see. We then headed up Oxford Street to Selfridges, where I treated myself to a new MAC lipstick and a couple of Lola's Cupcakes. Before we knew it, it was time to head towards the theatre for the matinee showing of Charlie and The Chocolate Factory that we had bought tickets for. This was the first West End show that either of us had seen and I think I speak for both of us when I say it exceeded our expectations. The costumes, staging and performance were all equally incredible. I was smiling throughout the show, and afterwards too. I'd definitely recommend going to see the show if you get chance to (I believe it's going on tour once it leaves the West End next year). After the show we started making our way to our hotel. However, when we left the tube station at Canary Wharf we were told that the road was closed for Top Gear filming. We stuck around and watched the filming take place, to be honest this really wasn't my cup of tea but my Mum enjoyed it and I did get to see Matt Le Blanc in person. Sunday was our final day of our break and we had a pretty relaxed morning in Covent Garden, where we did a little bit of shopping and grabbed some frozen yoghurt (yum!) and it was soon time to head back to the coach to start our journey home. Mum I'm sure you'll read this so I want to say another big thank you for a lovely weekend.